This is one POWER-Packed post. Full of Cranberry goodness! 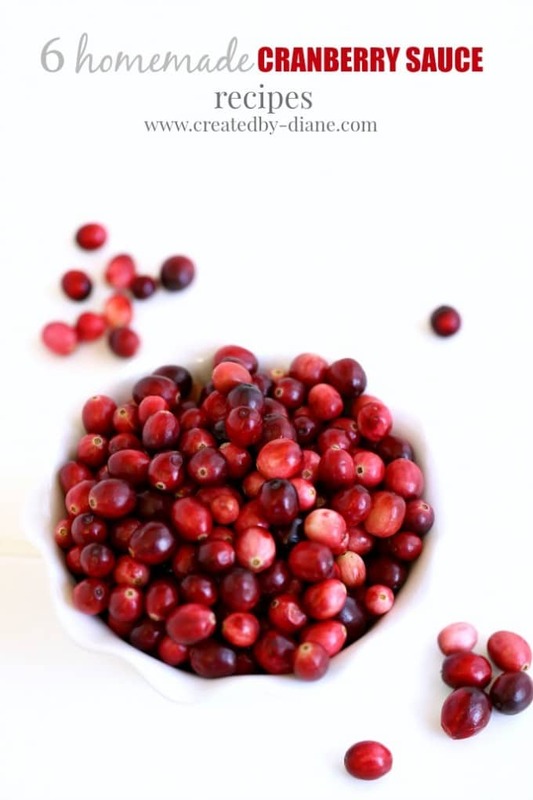 You cranberry problems are over! You are bound to find a new favorite recipe here. I’ve whipped up 6 brand new flavor combinations, they are all DELICIOUS. 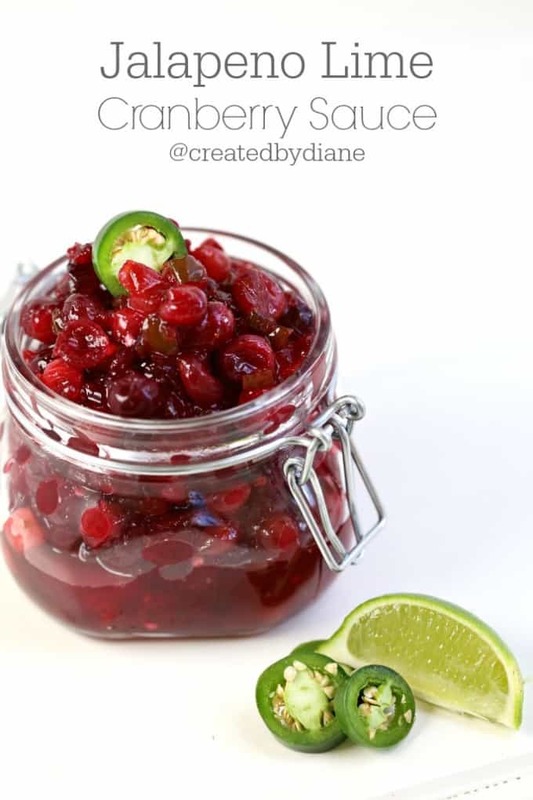 I had many taste testers and they agreed they were all delicious, some chose one or two above the others, all in all they said it was fun to have a brand new homemade cranberry sauce recipe that they hadn’t ever considered before. I think I went cranberry crazy… just a little bit. I went shopping and piled the cart high with bags of cranberries. The best part is, you can make the cranberry sauce ahead of time, no need to wait until the last minute. In minutes, you will undoubtedly find a new FAVORITE Cranberry Sauce! Fruity and delicious and pieces of apples mixed with cinnamon make this an apple sauce everyone will enjoy! Heat cranberry juice in a medium saucepan add the sugar and when it comes to a boil add in apples, cranberries, boil 8-10 minutes on low. Remove from heat. The sauce with thicken as it cools. You can refrigerate it to speed this up. Can be served warm or cool. 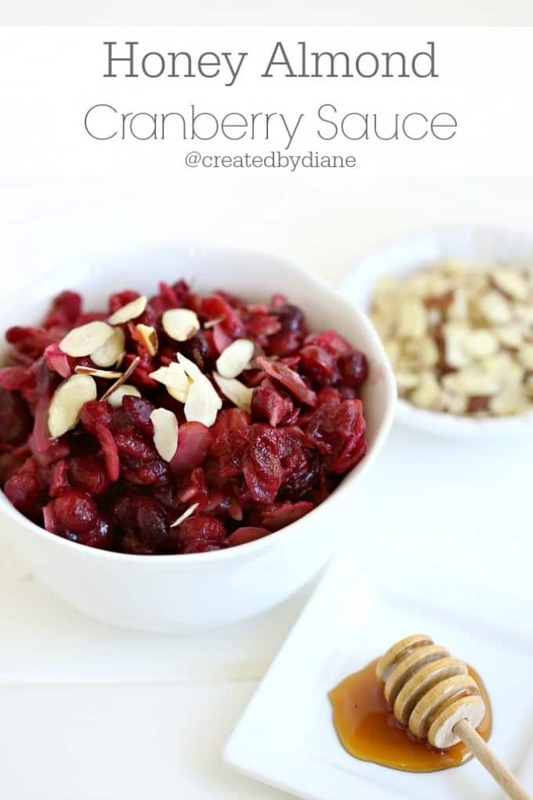 This cranberry sauce is sweetened with honey and has a delicious smooth flavor of almonds. Heat honey and water in medium saucepan until it comes to a boil. Add the cranberries and boil 5 minutes, then add in almonds and extract. 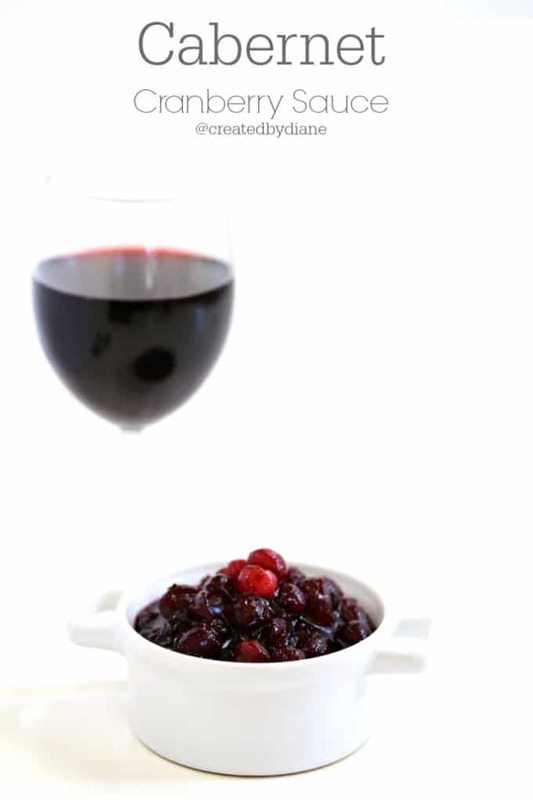 Cabernet cranberry sauce is perfect for any wine lover, it’s full of delicious flavor and a true winner! In a medium saucepan heat wine and sugar on medium heat until it boils. Add the cranberries and simmer 8-10 minutes on low. 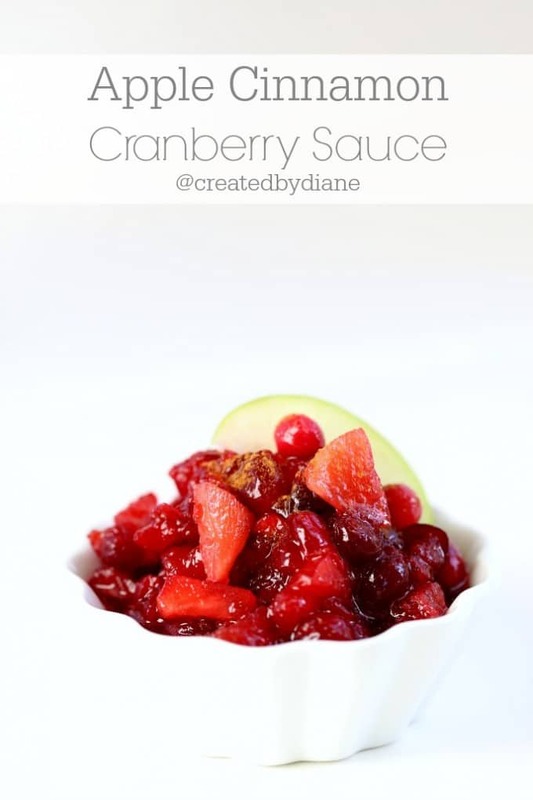 Spicy and sweet is where it’s at with this deliciously flavorful cranberry sauce. A real favorite! 1 cup fresh lime juice (4 large or 8 small limes approximately) you can add some water to adjust how much lime juice you get to reach a cup. In medium saucepan heat lime juice until it comes to a boil. Add in sugar, jalapenos, and cranberries, simmer on low for 8-10 minutes on low. The jalapenos I regularly find are flavorful but not overly spicy, and I included the seeds. Depending on how spicy your jalapenos are you can include or discard the rib and seeds of the jalapenos. 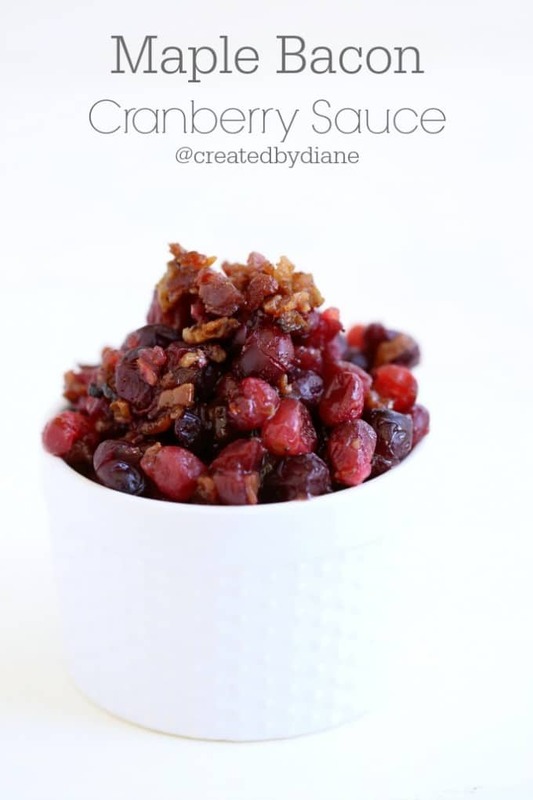 The sweet and smokey flavor in this cranberry sauce is a true delight to this bacon lover and is a must if you feel the same! Truly surprisingly great flavor. Add in sugar, cranberries, and bacon. Boil for 8-10 minutes on low. 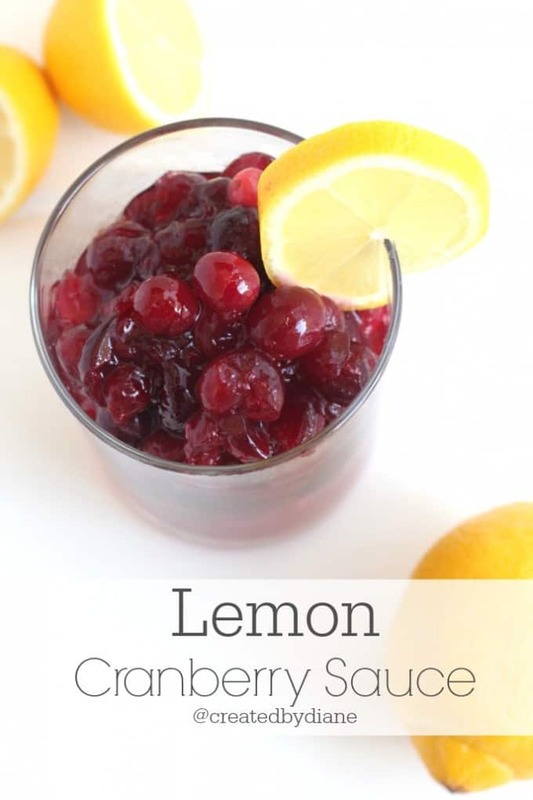 The wonderful fresh flavor of lemons perks up this cranberry sauce into something special. In a medium saucepan bring lemon juice and water to a boil. Add in sugar, cranberries and simmer on low for 8-10 minutes on low. If you like your cranberry sauce “saucier” add 1/4 cup more liquid, if you prefer it really thick, simmer it a minute or two longer. If you would like the cranberry sauce to be SMOOTH, press it through a fine sieve or mesh strainer with the back of a spoon, discarding the outer coating of the berries. 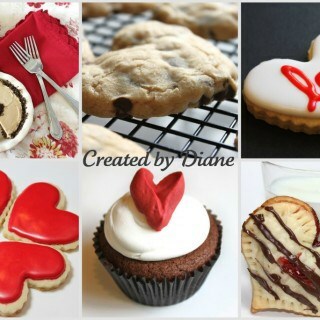 These recipes are not overly sweet. If you prefer your cranberry sauce on the sweet side add an additional 1/4 cup sugar. 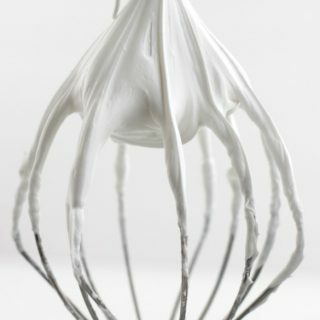 If you add it at the end of the cooking time, allow the sugar to melt and stir well so it dissolves. Cranberry sauce will keep well for over a week (or two) in the fridge. Make sure it’s in an airtight container. I prefer glass jars, they seal great and I just love seeing what’s in the fridge so they make it easy. 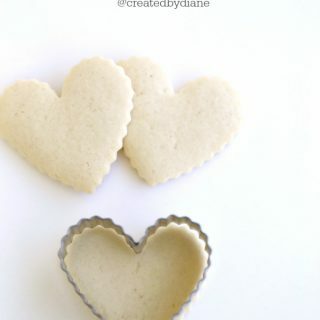 Each recipe can be cut it half to make a small batch, or doubled for a larger portion. 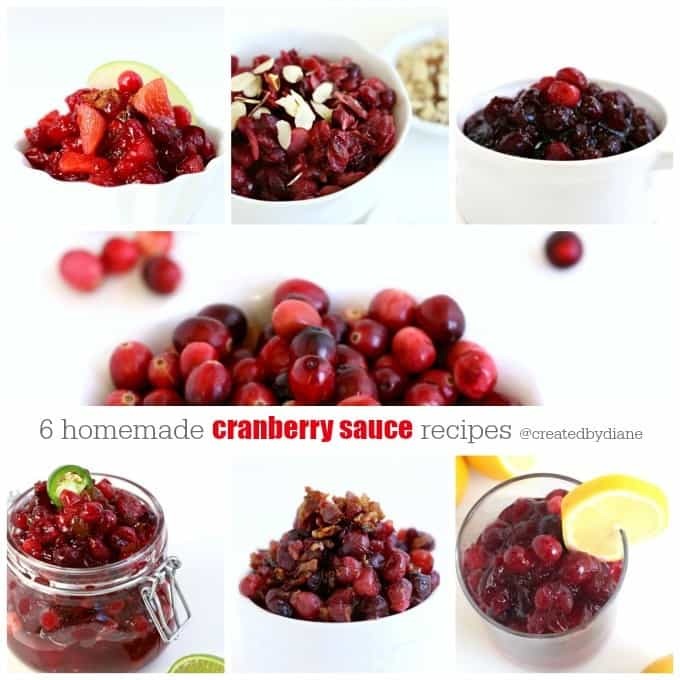 I’m a huge cranberry fan, I keep bags and bags in the freezer just so I can make recipes like these all year long! 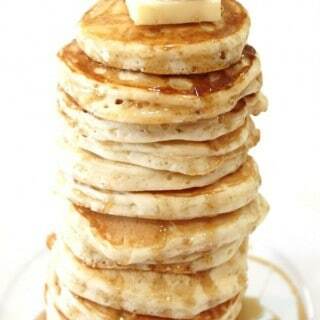 What a great list of amazing recipes! Thank you – it will be hard to decide which one to make! Wow, you had a lot of fun Diane! These are all so unique and sound wonderful!